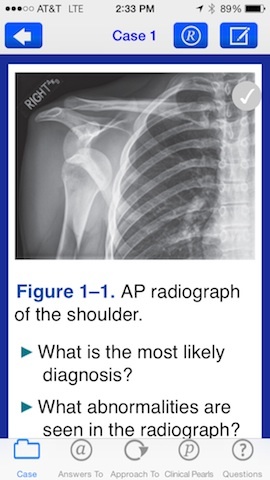 The Case Files series has been a great study resource for medical students for many years. The books cover a wide range of topics for various medical specialties by presenting key concepts through case examples and clinical vignettes. The series has recently moved into the mobile app relm. Many students are closing their books and using apps to replace these study resources. For many medical students, its much easier to carry multiple review books on their mobile device rather several bulky books in their white coat. Orthopaedic Case Files has an app equivalent that makes study and review much more convenient for students looking to learn more about orthopaedic surgery. 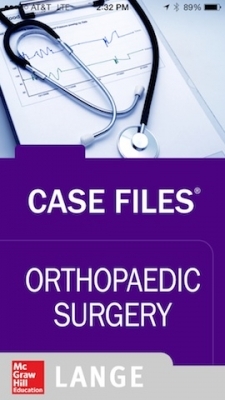 The app requires purchase to gain access to the 45 orthopaedic cases; its about $10 cheaper than the print version. Once the account has been created, the user has access to many different orthopaedic cases modules. The app opens into a list format for navigation and uses this format throughout the app. 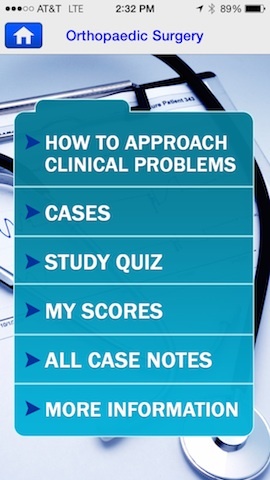 The first section on how to “Approach Clinical Problems” is especially useful to students new to clinical rotations. This app section includes exam and history information specific to the musculoskeletal system. This section is also a nice primer before reviewing the cases. The cases are presented in a list format. 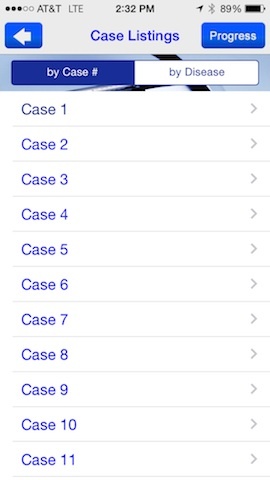 The user can go through cases in order, or by disease. Students can take notes during cases which is a nice feature for reviewing key points at a later time. The cases are enhanced with good quality images and radiographic findings. The cases cover a great range of topics from common injuries and disorders to more sub-specialty specific topics. They also discuss a wide range of orthopaedics topics from pediatrics, hand, foot and ankle, trauma, sports, reconstruction, and oncology orthopaedics. There are not many cases related to spine orthopaedics–a student assigned to this subspecialty of orthopaedics may not benefit as much from this app. Many healthcare workers and patients wanting to learn more about these common procedures would benefit from this app. Good graphics and easy to navigate user interface. Great overview of common orthopaedic topics and patient presentations. 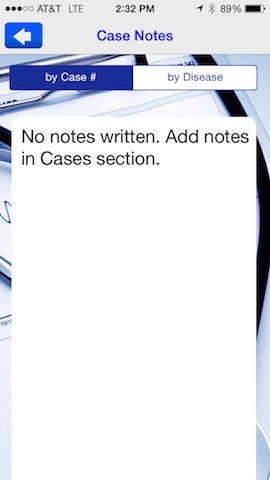 Notes option allows for note taking during case. Interface animation could be enhanced. The mobile app allows for more multimedia than a book. This is a good app for medical students looking for an app alternative to the book series. The price is a little high but gives a great overview of common orthopaedic cases. App is organized well and has an easy to follow layout similar to the book series. The $29.99 price will be prohibitive for many students, but could a better option for those intending to buy the book. 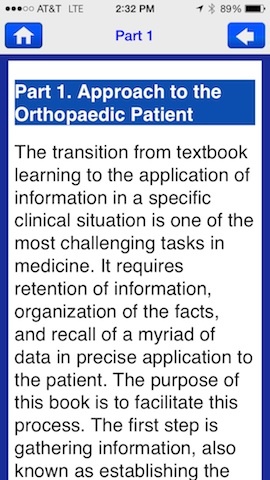 This app can be extremely useful to medical student and junior residents in orthopaedics.